2009 Dicken’s on the Strand, I actually remembered to takke some business cards. Lovely Ms. Sharon Thompson was walking with a group of her friends when she accosted Missie and I about our dresses. I was wearing my blue day outfit, and Missie was wearing the purple naturalform dress I had made her. She was very sweet, and complimentary, and I handed out cards to the entire group. I was, of course, not expecting to get anything back, but on the very next Tuesday, I received an email asking about the particulars of having a dress made! This is of course the week I am leaving to go back north, and I am leaving Thursday. On Wednesday, over red wine, and Italian food, we discussed her dress, and went back to her house to look at books. She and I have very similar tastes, so we liked many of the same dresses. These are the semi-final sketches for her dress. They will probably change some, as we are still a few months from starting the actual dress. She wants to be well dressed from the skin out, so we started with a full suite of undies. Now I will admit to going a little nuts with this. I really wanted to make a gorgeous set of undies, and so have done way too many hours of hand stitching, but it is always so worth it, and since I basically had a year…I indulged myself. I used a really old Folkwear pattern for these first pieces. I had used this pattern once before, and I really like how the camisole and open-bloomers went together. It is a lovely pattern, especially when you take the time to do the insertion lace. I really like the yoked bloomers. This keeps the part of them that is actually under your corset smooth so you have less digging into your flesh. 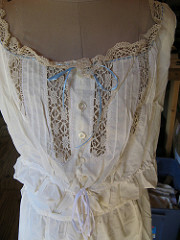 I also like to wear a corset cover as opposed to a camisole myself for the same reason of less fabric, but the camisole is much more feminine with its gathers and frills. I found all the lace on Ebay. It was old store stock and had matching insertion and edge laces. They are a natural ecru in color, and entirely woven with a design that makes me think of Elizabethan Blackwork pomegranates. Both of these pieces are cream colored cotton lawn. I really wanted to use Mother-of-Pearl buttons, and so went searching on Ebay again. I found a fellow in Muscatine, Iowa, that had found barrel after barrel of unused button in his barn and was selling them off by the batch. Apparently this little town in Iowa was known as the Pearl Button Capitol of the World. Who knew?! Anyway, I got enough that I could sort them, and have several different sizes to use. 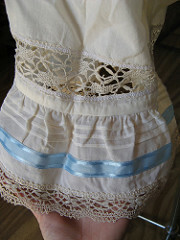 I used 3/8″ ones on the Camisole and 3/4″ on the bloomers. I am hoping to use them on the actual dress as well. I found 3 yards of this pale blue moire, and decided to use it for the accent color in the undies. The corset and bustle using most of it, with ribbon on the camilsole/bloomers, and petticoat. I used Truly Victorian’s corset pattern. It is easily the best fitting pattern, for the greatest range of people, that I have used yet. Again I indulged myself, with the top-stitching on the outer seams. This is extremely time consuming, even when doing it on a machine. Here is the rest of the moire in the bustle. I used the pattern I drafted up out of the Jean Hunnisett book years ago, with modifications. My main modifications are to split the interior panels that do all the bustling business. I have seen many fashion plates and contemporary examples of the split inside, and I find it far superior. It still collapses completely, and the top is the only part I ever adjust, and it’s pretty. I have made probably a dozen of these, and I keep adjusting them, as I look for the perfect one. I think this is just about the cutest petticoat ever! I want to keep it. I adore stripes, and I went a little crazy with these. I found this fabric at fashionfabricsclub.com, and bought it all. It is cream and tan and black, so I thought it worked really well with the color scheme of the undies, and was sassy as well. 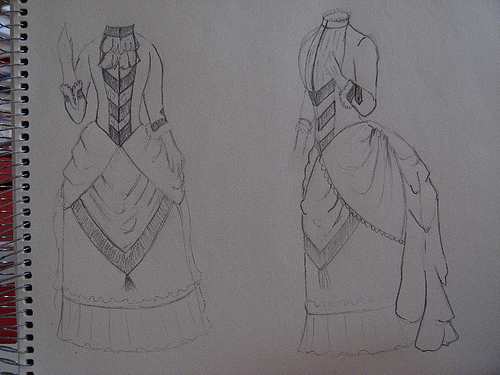 I have seen a few fashion plates where the petticoat was striped, and I love them, so this is my version. I did flat line the tucked panel that I put the bit of insertion lace into, with some of the lawn. I was afraid she might put her foot through the lace, or that the weight of the ruffle would mis-shape it. I completely understand why the flounces of striped skirts are usually on the diagonal…they are so pretty! and the bias gives them more flair. I do not usually do my ruffles out of bias because it eats SO much fabric, but this was worth it, and I had plenty of fabric. I am very pleased with how this is coming along so far, and I cannot wait to see how it all finishes out. The original concept for the day dress was textured wool, embroidered linen, and velvet, in purple, tan, and cream. I found some really awesome wool challis on Ebay in purple and black. It is lovely, but throws off what I had thought of initially, so now that the undies are done, I will focus on seeing what fabric we can find for the rest of the dress. It will be awhile before I pick this one up again, but stay tuned. Okay, well here you go, and all at once! To start, here are a couple of photos of Sharon in her undies. Okay! Now on to the Day Dress. The wool challis worked beautifully. We could not find anything that we had originally talked about to go with this, and I shopped all over the country, and have a mountain of swatches! Finally I went shopping personally in Dallas, and finally found what we needed. I got a lovely purple satin and some really fantastic beaded net. The net over the satin reads great with the wool. Although in the photos my camera had a hard time, and they look much more dissimilar than they actually are. The trim-y bits are 2″ wide velvet ribbon, and and great silver buckles that I got from MJ Trims. Love them! Unfortunately, I was so rushed that I did not really stop and take pictures of the entire process. Really, how many pictures of pieces going together does one need. Refer back to Melanie Baxter or Denise if you want to see individual piece assembly. Here is the in process front with the buckles and rouched net over the satin. You can see how the color is hard for my camera. I was really pleased with the way the buckles look with the net and wool. The buckles are functional, and behind them the satin edges close with 25 little black hooks and eyes. Not the jacket for a quick change. I know, there is way too much crap in the background, but my little house at TRF does not allow for a photo shoot area. If you look to the right over the dressform, hanging, is the skirts to what will be her ballgown. Any-who, this is the finished skirt set with the in-process jacket. Setting the bows was a seriously huge PIA! I could not just attach them to the net, the buckles+velvet was just too heavy. So I attached the top two all the way through the net and satin. The bottom one I attached the top lobes of the bow all the way through, but left the legs only attached to the net. I wanted the hem of the skirt to be able to move at least a little. I always hate it when skirts look like lampshades. Here it is finished. I added two more buckles to each sleeve, and there is also one on her hat. The sleeves are princess length so she can show a little black clad wrist. I am trying to convince her to let me make a dinner jacket to match. I think it would be stunning. I do not have any pictures of her in it yet. I only had a couple of hours to get it to her before I had to leave town. She was unable to join us at Dickens this year; at the last moment. I still need to get her ball gown finished, and I look forward to a bunch of pictures next year of her in both ensembles. And finished at Dickens in 2009!